This eSATA enclosure for 3.5 in. SATA HDDs is perfect for office, government, medical, and other personnel who require quick and easy access to important data and files. 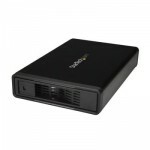 It is ideal if you need easy access to your data or need to back up, archive, or recover data and multimedia content. The external hard drive enclosure supports USB 3.0, also known as USB 3.1 Gen 1, and eSATA, which enables you to access your data through your preferred interface. For fast performance and efficient data transfers, when connected through eSATA, the enclosure supports full SATA III transfer speeds - up to 6Gbps. For universal compatibility, the enclosure can be connected through USB 3.0 with transfer speeds up 5Gbps, plus support for UASP. The HDD enclosure lets you connect a SATA III (6Gbps) hard drive, but is also compatible with SATA I and II. The hard drive enclosure enables you to swap drives in and out as needed, with the trayless design. The enclosure is simple to set up and easy to use, with its plug-and-play functionality. Itâ€™s is also equipped with an LED light to indicate power and activity. With a sleek, compact style, this hard drive enclosure is a perfect desktop companion for your Mac or PC. It occupies minimal space and features a fanless design that keeps the enclosure quiet so you to focus on whatâ€™s important. The S351BMU33ETG is backed by a StarTech.com 2-year warranty and free lifetime technical support.